Meet John Ratcliffe – the man who just knocked the oldest congressman in the nation’s history out of a job. A former U.S. attorney, Ratcliffe is the first challenger in this campaign cycle to defeat a sitting member of Congress. He broke the streak of incumbents’ successes Tuesday night with a convincing runoff defeat over Rep. Ralph Hall, who was seeking his 18th term in office at the age of 91. Ratcliffe -- at 48 almost half Hall's age -- claims he did not make age an issue, but his ads touted "fresh energy" and a "new generation of conservative leadership." The Texan challenger says he was merely questioning Hall's long tenure in Congress. "He's been there 34 years,” Ratcliffe told NBC News. “I think that's too long. I think these are two-year terms for a reason. I don't think our founders intended someone to serve 18 of them!" Ratcliffe, who has promised not to serve more than eight years in Congress, campaigned as a conservative, running to Hall’s right and touting endorsements from the Senate Conservatives Fund and the Club for Growth. And in border state Texas, he highlighted his staunch positions on immigration as well. During an appearance on MSNBC’s The Daily Rundown last week, Ratcliffe offered flat opposition to any immigration deal that offers a path to citizenship for undocumented immigrants. “That isn't going to help this country,” he told host Chuck Todd. Alluding to the idea of “self-deportation,” Ratcliffe added that the federal government should more aggressively punish those who overstay visas. While Ratcliffe won the backing of several tea party groups, including the Tea Party Express and the North Texas Tea Party, he told NBC's Kelly O'Donnell he doesn't think of himself as a "Tea Party conservative." "I don't like labels,” he said. “I think that's a Washington insiders game. What I ask people to do is look at my record. I'm someone who's defended our Constitution as US attorney ... been fiscally tough as a mayor, balancing budgets. I think that's a record that appeals to all Republicans." 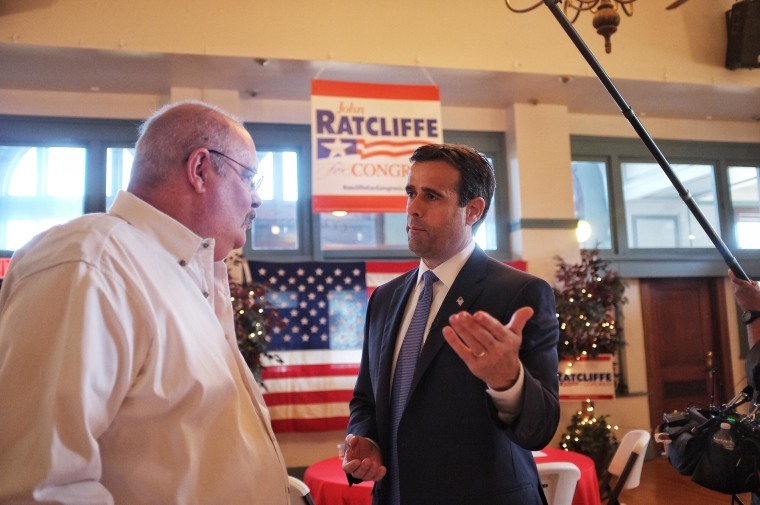 With no Democratic opponent this fall, Ratcliffe is almost assured of being elected to Congress. But he says he's not sure he'll vote for John Boehner as House Speaker, adding "we have to do better." "Part of the problem that we're facing today as Republicans comes from our own GOP leadership. I don't put that solely at the feet of Speaker Boehner. I don't know him personally. But I have said that I would like better leadership,” he said. “I would like to sit down with ALL of the choices I have for Speaker before I make a decision." He also says he's not sure he'd vote for Rep. Paul Ryan's budget either, saying he doesn’t think the blueprint is “aggressive enough." The first bill he wants to introduce in Congress? A constitutional amendment to balance the budget.